In WWII, young pilots in their late teens and early twenties flew high performance aircraft like the P-38 Lightning, P-51 Mustang, or Heavy Bombers like the B-24 Liberator. These courageous youth wore A-2 flight jackets of sheepskin, goatskin, and horsehidein order to keep them warm when flying at altitude, or as an impenetrable "second skin" when flying on low level, (high risk) strafing runs over enemy territory. Often times the pilots would find someone in their squadron to paint the nose of their plane to represent something or someone from their home life, in hopes it would bring them good luck, as they 'stuck-it' to the enemy. On occasion they would find an artist to paint that nose art on their flight jackets. I have painted a half a dozen jackets over time, each representing some warbird that played a roll in winning the war for the allies. 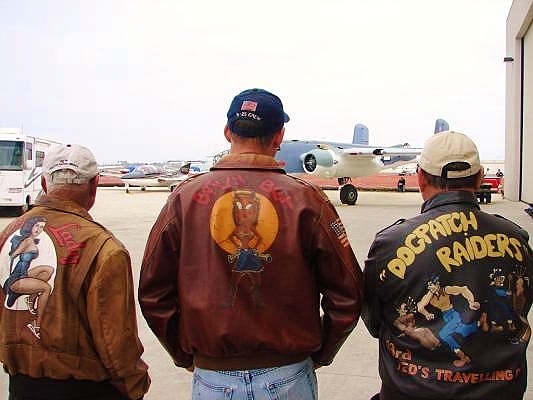 At Monday's event at the CAF where FIFI flew in to Camarillo, I was greeted by the owners of two flight jackets I was commissioned to paint a few years ago; "Lucky Lady", and "Dog Patch Raiders". This picture shows Gino, and Joe wearing A-2's with my art work on them. 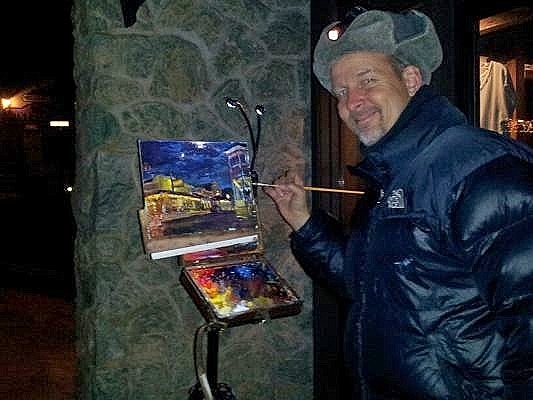 I of course am wearing the jacket "Batlin' Bet", a 50+ mission P-38 or the 15th AAF which had a caricature of my Mom painted on the nose, painted by it's pilot, Lt. Kenny Frost.